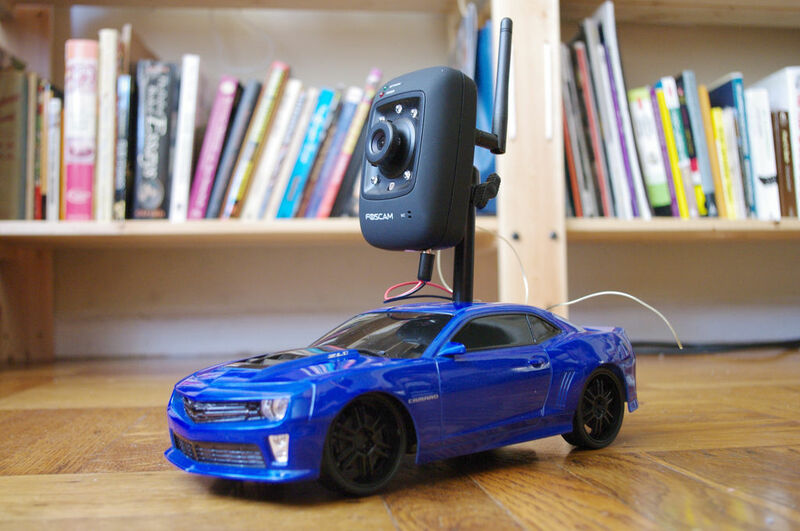 The Internet Controlled RC Car allows you to remotely drive around a small rc car from wherever you may be and see where it is going. This is fun because you can remote explore whatever space you leave it in, or hand over the keys – so to speak – and allow someone to drive around your space. This is also a great building block for a telepresence robot. This project is also a great beginner project for someone who has made a few simple things and is looking to get slightly deeper into the world of microcontrollers. It starts to incorporate more advanced skills like circuit building and networking, but is not dauntingly complex. Insert the shield’s male header pins in the matching female header pins on the Arduino. Remove the four screws from the bottom of the RC car keeping the top plastic cover in place, and put the screws aside for later reassembly. Build the circuit to convert 7.2V to 5V on the 1″ round PCB as specified in the schematic. Attach a red wire between the 5V output on the power conversion PCB and the K-type plug’s center pin. Attach a black wire between ground and the outer jack connection. Twist the cover on the jack shut to insulate it. Connect a black wire between ground on the round power conversion PCB to the center pin on the M-type jack. Connect another black wire to the pinon the M-type jack to the left of center. Connect two red wires to the pin to the right of center. Connect one of these red wires to the power input pin of the LM7805 voltage regulator. Cut the power connector off of the 7.2V rechargeable battery. Solder the red wire from the battery to the unused red wire from the M-type jack. Solder the black wire from the battery to the unsused black wire from the M-type jack. Insulate any exposed connections with shrink tube. Remove the screws from the remote control and open the case. Next, remove the screw securing the circuit board in place, and cut the wires going to the battery compartment to free it from the case. Use a Q-tip covered in rubbing alcohol to clean any grease that may be on the contacts for the joystick controls. Solder wires to each of the contact pads for the remote control’s joysticks. Solder four relays to the rectangular PCB board. Wire the remote control board to the relay board as specified in the wiring diagram. 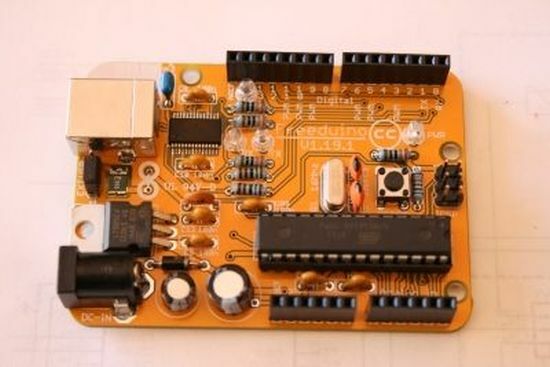 Connect the Arduino to the relay board as specified in the circuit diagram. Setting up the wifi camera could be an Instructable unto itself, and I am not going to go over it here. That said, it comes with a pretty thorough instruction booklet for getting it configured. To get it running, just follow along with the instruction booklet that came with the camera. What I will go over is the Arduino program. Fortunately, there is not much to cover. The Arduino will be used to load a website at specific IP address. When you click on the links on this website, it will send HTTP requests back to the Arduino. These requests are then processed by the Arduino to trigger the relays connected to the car’s remote control. When the relays are toggled high, the remote is activated and the car moves around. You can then see where it moves by loading the web interface for the IP camera in the background. Attach the antenna back to the appropriate part of the remote control board using a nut, bolt and washer.